The document is focused on providing information on the standards presently in place in Canada that are specific to the use of nanotechnologies in the textile industry. The context is that Canadian textile firms considering utilizing nanotechnologies in the development of new innovative textile products must be knowledgeable about the state of standardization of nanotechnologies related to textiles. The document provides information on which nanotechnologies are typically used in the textile industry and which properties they impart on textiles, and includes information on standards such as: a description of what standards are, how they differ from regulations, how they are developed in Canada and internationally, and provides suggestions on how the Canadian textile industry can become involved in future nanotextile-related standards development. The document is authored by the CSA Group which is the Canadian Standards Development Organization responsible for nanotechnology-related standards development. Modern microscopy has revealed increased surface area and quantum effects of materials on a nanoscale (i.e., 10-9 to 10-7 meters). Such discovery, referred to as nanotechnology, is providing unique functionalities in materials not commonly associated with the same materials in bulk. Unprecedented global research is under way to capture and commercialize these functionalities in reproducible and scalable-to-production forms for economic benefit in modified and new products. In the textile field, nanomaterials based upon common elements, such as carbon, gold, silver, and associated compounds and composites, can provide technical and value-added textiles with improved functionality for a broad range of applications. Nano-enabled functionalities for textiles may include antimicrobial performance; flame, shrink, wrinkle and stain resistance; material strength; ultraviolet (UV) protection; luminescence; sensing; energy production and electrical properties. Industry has indicated a lack of standards and uncertainty about the evolution of standards as important challenges in developing and commercializing nanotextiles. Industry Canada has requested CSA Group, Canada’s largest standards development organization, to report on standards specific to nanotechnologies and textiles to assist with commercialization of value-added nano-enabled materials and products for Canada’s textile industry. For phase one of this Industry Canada project, CSA Group submitted an article on standards and nanotextiles as part of a three-part feature for the CTT Group publication The Textile Journal . Accompanying the CSA Group’s article are an introduction to nanotextiles, and an overview on regulations authored by CTT Group. Phase two of this project is this detailed report on standards for nanotextiles, a precursor to further discussion and collaboration with nanotextile innovators in the textile industry. Standards and regulations are often referred to synonymously; however, they are unique entities with different but supportive roles, which is covered in this report to ensure clarity in later discussions on standards for nanotextiles. A document, established by consensus and approved by a recognized body, that provides for common and repeated use, rules, guidelines or characteristics for activities or their results aimed at achieving the optimum degree of order in a given context. The use of standards is not new to the textile industry. Standards are referred to and applied every day all along the textile supply chain, providing rules, test methods, specifications and best practices. Standards establish accepted practices, technical requirements and terminologies for products, processes and services. Standards can assist organizations to ensure their products and services are consistent, compatible, effective and safe. The many standards used by the textile industry can be found in a 2010 CTT Group report.Footnote 2These standards will not be repeated here. Instead, this report will focus on standards related to nanotechnologies and how they may be applied in the textile industry to assist innovators to move forward in the commercialization of nanotextiles. In more detail, it is a government/jurisdiction imposed requirement that specifies product, process or service characteristics with which compliance is mandatory in an applicable jurisdiction. Regulations may be statutes and may be applied within the jurisdiction that uses them; for example, municipal, provincial or federal. Regulations for nanotechnologies are not the subject of this report and have been covered in a separate Industry Canada project tasked to the CTT Group. However, regulations are mentioned in this report as they often reference standards. As an example, regulations and standards may both address a product safety requirement. A regulation may control and limit importing certain products into a country for the safety of its constituents. Such regulations may stand alone or may reference standards. An example might be a medical device, such as an implantable hip joint. Regulation of medical devices falls under federal jurisdiction. A federal regulation requires evaluation of that device to ensure its safety before it can be used in Canada. The method of evaluation and test criteria to verify the suitability of that device may be documented in a standard, which may then be referenced by the federal regulation. This reference, somewhat of a validation of a standard's worth, makes requirements in a standard mandatory within the jurisdiction of the regulator. Means to comply with the standard may range from supplier declaration to evaluation by a third-party certification body. This is specified by the user of the standard, which could be a regulator. Depending on the subject area, regulations can be enacted by different levels of government. As mentioned above, for example, regulation of medical devices falls under federal jurisdiction. Most requirements for workplace safety, on the other hand, fall under provincial jurisdiction. Hence for occupational health and safety (OHS), standards may be referenced; for example, safety boots (protective footwear). Many products, processes or services are required by legislation to be tested and certified (referred to as a conformity assessment) by a third-party certification body to establish compliance with specific standards or other recognized documents. Certification body services include testing, evaluation, verification and certification. As an example, the CSA Group standard for protective footwear includes basic design criteria along with repeatable test methods with established test criteria. Manufacturers enter into a legal agreement with the certification body when certification is granted, indicating conformity (fulfillment by a product, process or service of specified requirements). A certification mark informing the buyer that the product meets certain requirements may also apply. This is a protected mark, applied or issued under the rules of a certification system, indicating that confidence is provided that the relevant product, process or service is in conformity with specific standards or other recognized documents. Currently, there are no certifiable requirements specific to nanoscale properties of products in Canada. This may change in the future, or perhaps performance-enhanced capabilities will be addressed in existing standards for that same product. To date, international standards for nanotechnologies encompass terminology, methods, specifications and guidance only. Standards are voluntary, but can have a mandatory role if referenced in regulations. To date, standards published by the International Organization for Standardization (ISO) and International Electrotechnical Commission (IEC) for nanotechnologies are voluntary. As of 2012, uptake by government to reference nanotechnology-related standards in relevant regulations has not yet occurred. However, standards published and being developed could be referenced if regulations at various jurisdictional levels are put into place for nanotechnologies. As will be discussed, some published ISO standards for nanotechnologies are being adopted in Canada, as National Standards of Canada, for voluntary use. Standards number in the tens of thousands globally, standards for textiles likely in the thousands and standards for nanotechnologies are currently less than 50, but the number is growing. This section will focus on nanotechnology-related international standards from the ISO and IEC. The ISO and IEC are the two predominant international standards development organizations (SDOs), both with widespread global influence and recognition, and involvement in nanotechnologies. How these international SDOs interface with their member countries, particularly Canada, and with many of Canada's trading partners will also be explained. Both the ISO and IEC develop standards in over 300 product and service areas. A technical committee (TC) is designated for a product or service area for which a need for standards has been recognized and a commitment has been made by multiple countries to develop and support standards in the subject area. With a long history in established products, one ISO technical committee likely familiar to the textile industry is ISO/TC38, Textiles (with 350 published standards). With many standards developed and maintained over the years, ISO/TC38 is an early player in the field of standardization. New technical committees in new technology fields are established every year by the ISO and IEC; for example, IEC119, Printable electronics, in 2011 and, already seven years old but still considered new technology, ISO/TC229, Nanotechnologies, and IEC/TC113, Nanotechnology standardization for electrical and electronic products and systems. ISO/TC229, Nanotechnologies, was formed in 2005 with Canada as a founding member country and national committee participation by researchers, industry, governments and users. This ISO technical committee is active concurrently with worldwide research into and commercialization of nanotechnologies to observe economic and social benefits through technical innovation. Companies pursuing innovation with nano-enabled textiles should develop products with standards in mind. Standards help business and should not be viewed as a burden. Standards assist in reducing barriers to trade and in ensuring safety in materials, components, products and systems. Understanding and meeting requirements in standards, heeding documented guidelines and following best practices are all important steps towards business success. As well, the collaborative nature of standards development provides means to share ideas and common practices among stakeholders in textile and related product sectors. As regards innovation with nanotextiles, some of these same barriers and priorities may apply. Application of scientific knowledge to manipulate and control matter in the nanoscale in order to make use of size– and structure–dependent properties and phenomena, as distinct from those associated with individual atoms or molecules or with bulk materials. NOTE: Manipulation and control includes material synthesis. Size range from approximately 1 nm to 100 nm. NOTE 1: Properties that are not extrapolations from a larger size will typically, but not exclusively, be exhibited in this size range. For such properties, the size limits are considered approximate. NOTE 2: The lower limit in this definition (approximately 1 nm) is introduced to avoid single and small groups of atoms from being designated as nano-objects or elements of nanostructures, which might be implied by the absence of a lower limit. Features or performance made possible by nanotechnology. Standards from ISO/TC229 are attempting to address these concerns in part by providing terminology, measurement methods and assessment techniques in a range of work items, each leading to a standard. A key aspect in recently published standards is guidance for life-cycle analysis in the supply chain where nanotechnology is used, be it material, component or product. A life-cycle analysis follows a product from raw material through to end-product use. This is an important consideration in standards for nanotechnologies. Such analysis can assist industry in isolating specific areas of concern for nano-enabled products and in addressing them in a recommended manner. 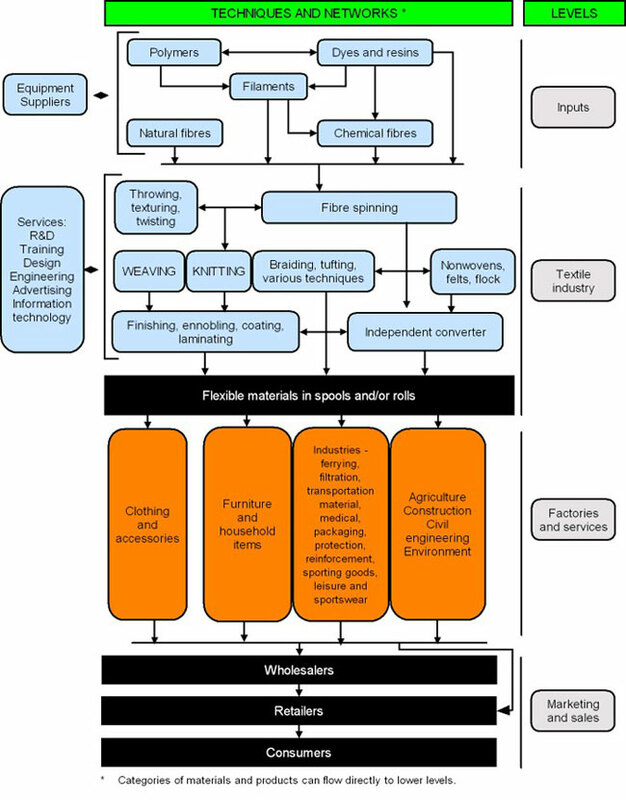 A product's life cycle is illustrated in Figure 1 and in more detail, in the context of the textile industry supply chain, in Annex A. The figure depicts how products produced are part of a larger cycle of production, use, and recycling. Specifically, the figure outlines the steps of production (material extraction, material processing, and manufacturing), use, and waste management, and how the waste products can be re-used, re-manufactured, and/or re-cycled. As an emerging technology, moving science and research in the lab through scaling up to production levels is a major challenge for nanotechnologies. Standards may assist in providing methods and guidance as you move up the innovation chain (Figure 2). The figure depicts innovation as being based in research, which then can lead to product innovation, which can then in turn lead to product commercialization. 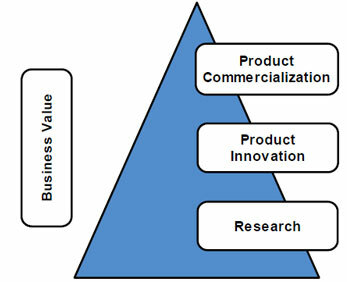 As a product moves up this innovation chain towards commercialization, the business value increases. Source: Sarma, H., Industry Participation in Nanotech—Standards—Strengthening Ties. Presented at IEC/TC113/AG4—Chair Advisory Group, Seattle, Washington, 2010. Each level in the innovation chain is important as a means to subdivide nanotechnology into more manageable pieces. This is important in revealing and isolating unique nano-enabled aspects so that cause and effect can be understood and addressed responsibly. This also assists in avoiding a wide-brush approach to discredit innovation in nanotechnologies. The application of nanotechnologies to textiles affords an expanded array of properties with potential for improved and novel use in materials and products. Changed or improved properties with nanotechnologies can provide new or enhanced functionalities. How are these realized in materials and processes? How do they appear in end products? The information presented in this section is not exhaustive, but does reflect current national and international research, and commercial activities in nanotextiles. As examples, antimicrobial textiles include anti-odour, antifungal and antibacterial textiles. This applies to products whose fibres possess intrinsic bactericidal properties or will acquire them through subsequent treatments (chemical finishing, nanotechnologies, addition of bactericidal metals, etc.). Products have potential applications in apparel and intimate apparel, but also in a number of non-apparel applications (furniture, carpets, etc.). These textiles significantly reduce or even eliminate traditional textile-care operations (washing, spin drying, drying, ironing). Properties include spill, wrinkle, oil and stain resistance. These are properties and applications with potential to provide value in products. Some can be achieved by conventional means, e.g., wrinkle resistance, but with research, alternatives or improved means via nanotechnologies may be found. Lower processing costs, less energy usage or reduced chemical processing may be other value-added factors resulting from the use of nanotechnologies. Much of this is at a research/concept stage, with some application in products now. Nanofinished textiles are those that apply a nanoscale property added after the base textile has been fabricated. This includes post-manufacture treatments and coatings to apply nanomaterials or create nanostructured surfaces on fibre media. Additive nanomaterials to date include metal nano-objects (such as silver for antimicrobial functionality) or clay nano-objects (for fire resistance). Nanostructured surfaces may include those roughened by treatments (hydrophobicity for self-cleaning). For existing process lines, nanofinished textiles may only require the addition of intermediate steps for coating or treatment. The majority of nanotextiles already on the consumer market fall within this category. Nanofinishing can provide accessible means for established textile manufacturers to engage with nanotextiles. Nanocomposite textiles have composite fibre materials containing one or more nanostructured or nanoscale components. This type of nanotextile centres upon pre-manufacture integration of nanoscale properties into fibrous components. The source materials added to produce the nanocomposite textile include, for example, carbon nanotubes (for enhanced fibre strength) and rare earth metal doped nanoparticles (for luminescence). Polymer matrices are the most prevalent in nanocomposite fibres; however, other matrices may also be useful. Similar to nanofinished textiles, nanocomposite fibres may not require significant changes to the manufacturing process. If the matrix material is the same shape and size as the process has been designed for, only small alterations may be necessary to integrate the composite component. If the fibre material is entirely changed by choosing a different matrix material or significantly altered by the composite properties, significant reconfiguration may be needed. Alterations to the base material achieved at the research level may face challenges in scaling up to production to realize a stable composite material. These nanotextiles have promise, but currently represent a relative minority in commercialized form. Nanofibrous textiles have fibres with nanoscale dimensions. These true nanofibres have a nanoscale cross-sectional area and may or may not have a nanoscale length. Fibre material may be either a single material or a composite (which, based on the fibre dimensions, may also be a nanocomposite). Nanofibres may also be nanofinished. These nanotextiles focus on fabricating fibres to exploit nanoscale properties. These properties may emerge either from the nanomaterial composition (such as fibres made of carbon nanotubes, giving them very high strength) or from the scale of the individual fibres (such as filter media, giving them increased fibre surface area and nanoscale porosity). Fibre fabrication for nanofibrous textiles typically would be new. Not only does initial fabrication of the fibre require a process that can create nanofibres (such as electrospinning or forcespinning, which are not conventional drawing methods), but all of the subsequent steps in the manufacturing process must accommodate these smaller fibres. For woven textiles, the technology does not exist on an industrial scale to weave fibres of this size. Beyond that, dyestuffs and laminations may have to be reformulated for nanofibres. Some means of incorporating nanofibres into textiles may be accomplished through entangling or encapsulating the fibres in a larger fibre. While research into nanofibrous textiles is widespread, little has reached significant commercialization. Its development, however, may afford exciting applications and opportunities. Nanotechnologies in nonwovens may make use of improvements in properties to benefit textile processing; for example, adhesive properties may be enhanced or conventional methods of securing layers replaced with adhering nanostructured surfaces. Other nanoscale functionalities may utilize nanofilms or coatings in layers or barriers; for example, for antibacterial properties, energy production (for solar power) and luminescence (for colour control). Table 1 provides an expanded list of nanotechnology properties undergoing research or being applied in nanotextiles. The associated functionality/application at the nanoscale and process method used are also listed. Depending upon the type of nanomaterial, manufacturing for textiles may or may not be a simple derivative of current macroscale processes. A nano-object raw material may be purchased as an incoming component for integration into a process line. The material sourcing stage of the supply chain will be affected by standards, with a need for compliance to ensure consistent raw materials. Standards on grading or specifying materials (such as silver nanoparticles, nanofibrous media, etc.) may be useful. Safe handling of materials; means for process control, paying attention to key control characteristics; and quality inspection of output may be supported by standards. Production of nanomaterials may require advanced equipment not typical within the textile industry; for example, treatment chemicals, polymer composites and thin film coatings. Nano-object generation may use advanced machines (such as ball mills, solgel apparatus and plasma torches). Consideration of workplace safety when using these processes and waste management review may apply. Operations with established quality assurance and health and safety systems, in accordance with management system standards, will find new or modified nano-enabled processes easier to implement. For nanofinished textiles, one must consider the nano-object being applied. Spraying techniques, chemical baths and electrostatic adhesion are a few general categories. Some of these techniques are similar to current post-processing methods, such as dyeing; however, new considerations tailored to nanomaterials may be required. For nanocomposites, the matrix must be produced first and then fibres fabricated. Techniques may be adaptable from conventional fibre fabrication. While the process may be compatible with the composite material, changes in properties, such as strength, may confound the process. Nanofibrous textiles will be more complex, requiring new processes from basic fibre fabrication to the finished textile. To achieve nanoscale fibre dimensions, new manufacturing techniques must be used ranging from electrostatic to mechanical spinning. Post-drafting both woven and nonwoven products would require modified techniques to assemble the fibre media. At a high level, the processes used may not be that distant from those used for macroscale fibres; however, current infrastructure may not be compatible for nanofibrous textile manufacture. Test methods and characterization are critical for any industrial sector. The ability to accurately and precisely describe a material through to final product is important to define key control characteristics to comply with to ensure product quality. Testing and characterizing nanotextiles may pose challenges not found in regular textiles. On the macroscale, such as wear or tensile tests, the means are not very different if using nano-enabled materials or components. The integrity of a nanomaterial may be certified by the supplier, but if verified in-house, for a nanomaterial or nanostructured surface, advanced microscopy, calorimetry and spectroscopy techniques may be required. Standards may be a resource for testing requirements and best practices for such measurements. Material specifications are critical in manufacturing. Nanomaterials have unique properties requiring close control of parameters so as not to alter performance. If a batch of nanoparticles used for a nanofinishing process is not within specifications, it may not perform according to the properties it is designed for. Parameters in addition to size may require precise control. Material specification standards are still at the early stages of development. Research is currently predominant for nanotechnologies, preceding scaling up to production, at which time production standards, such as material specifications, will become prevalent. Product sector-specific standards (e.g., coatings for nanotextiles) will need industry involvement to be developed; for example, to provide technical content. Product quality assessment and certification are other considerations. At the end-product level, performance-based standards for final products may not likely need revision. The bar may be raised as a result of improved function, but the testing method may remain as is. Often already in place, as deemed mandatory by regulation or purchasing specifications set by a customer, compliance with product standards requirements will, of course, continue. Products may be verified by "type tests" for conformity with requirements (on new product submissions) and then periodic reviews (follow-up visits) of whether the product still meets performance criteria in accordance with a certifying body's accredited requirements. Management system standards support quality assurance and environmental stewardship, including ISO 9001 and ISO 14001 respectively. Such standards may be a customer requirement, or may be recognized and complied with as part of a company commitment to quality and social responsibility. With such standards in place, analysis and control to encompass nanomaterials and associated processes may be more easily implemented (steps to follow, to add or modify materials and processes in accordance with, for example, ISO 9001, would already be understood and documented in a company's policies and procedures). Finally, health, safety and environmental controls related to nanotextiles will be enhanced by standards. Nanotechnology-specific OHS and risk assessment standards for nanotechnologies are available from the ISO as first steps in guidance for workplace safety and hazard mitigation. All of the answers are not there yet as one cannot anticipate where new research will lead, what new nanomaterials may be used or how they will be applied. However, standards from ISO/TC229, including standards being adopted in Canada by CSA Group, encompass the precautionary principle and life-cycle analysis. These are both recognized as important principles to follow by jurisdictions in Canada where this has been reviewed (see Section 6e). The textile industry is familiar with the challenges imposed by both occupational and consumer health concerns with materials. Nanomaterials bear no exception to these controls. Current facility controls may require enhancement, from ventilation systems to personal protective equipment to waste processing. Methods for assessing the toxicity of nanomaterials are still at the early stages of development, but progress is being made, for example, in global regulatory activities at the Organisation for Economic Co-operation and Development (OECD) to test nanomaterials. This is concurrent with research by many countries into the toxicity of nanomaterials. New standards from ISO/TC229 and IEC/TC113 in support of safe and responsible use of nanomaterials are under way. Such published and in-progress standards are listed in Annex B and Annex C respectively. Standards are developed taking into consideration and based upon public, industry and regulatory interests. Standards may be relied upon by industry seeking objective guidance for the integration of nanotechnology into textiles. A standards development organization (SDO) follows an accredited process that meets criteria for open and consistent development of a standard's content. The SDO serves as the organizer or "facilitator" of the process, not the writer of the standard. Writing, or "drafting", is duly placed upon a committee of technical experts in the applicable subject area. This frequently includes a range of interests including, but not limited to, industry, regulators, general and users. After development of a draft document, and after reaching consensus among committee members, an accredited standards development process includes a public review step, followed by member voting (ballot). After ballot comment resolution in accordance with the process, the standard is published. Standards are maintained and updated at regular intervals, usually by the same SDO-administered committee. At the global level, the ISO and IEC oversee international standards development with member countries participating via their national standards system. The structures of these systems may vary among countries, but in Canada the National Standards System (NSS), and its participation in the ISO and IEC, is represented by the Standards Council of Canada. There are many SDOs throughout the world, with some serving as the direct entry point for a country's participation in the ISO and IEC. Others achieve this through a collective entity. In the United States, there are over 200 SDOs. Accreditation for SDOs with qualifying development processes is provided by the American National Standards Institute (ANSI). The ANSI is the United States' entry point to the ISO and IEC. Technical committees are referred to as U.S. Technical Advisory Groups. SDOs also include organizations such as the American Society for Testing and Materials, the Technical Association of the Pulp and Paper Industry, the Institute of Electrical and Electronics Engineers (IEEE) and others with national or international mandates and members. Cooperation and collaboration are common among SDOs, typically covered by Memorandums of Understanding. Co-publishing of standards can also occur with agreement among organizations; for example, IEC/TC113 and the IEEE have a dual-logo agreement for nanotechnology standards, having jointly published one standard on carbon nanotubes to date. The SCC is a Crown corporation and a member of Industry Canada's Industry Portfolio. In Canada, the NSS is led by the SCC, whose mandate is to coordinate and oversee the efforts of the system, which includes organizations and individuals involved in voluntary standards development, promotion and implementation in Canada. Government, business and industry, and consumer organizations are key stakeholders within this system. One of the SCC's roles is to accredit organizations that develop standards. The SCC also serves as Canada's World Trade Organization and North American Free Trade Agreement enquiry point. The SCC is Canada's representative at the ISO and IEC. The SCC's facilitation and management of standards activities on Canada's behalf within the ISO and IEC, as prescribed by the Standards Council of Canada Act , carry strategic importance to the economy, sustainable development, the welfare of Canadians and trade. Project stages followed by the ISO and IEC are presented in Table 2, with more information available at www.iso.org and www.iec.ch. As a participating member country in the ISO and IEC, the SCC and often a SCC-accredited SDO jointly facilitate the process of negotiation and consensus building among national stakeholders in SCC mirror committees, and through these committees contribute to the process of international negotiation and consensus building for international standards. Close cooperation and synergy are required between the international standardization work taking place in international technical committees and the national standardization work taking place in the SCC mirror committee. CSA Group jointly facilitates with the SCC the work of Canada's SCC mirror committee for ISO/TC229 and IEC/TC113 for nanotechnologies. International meetings have been held twice a year to date. As of March 2012, Canada's "Nano SCC Mirror Committee" has 90 members and typically meets one month before and after international meetings at various locations throughout Canada, having last met in Montréal in March 2012. Along with research, industry, general and user interests, federal government participants on the Nano SCC Mirror Committee include members from the National Research Council Canada (NRCC), Health Canada, Environment and Climate Change Canada, Industry Canada, the Canada Food Inspection Agency and Foreign Affairs and International Trade Canada. NRCC and Health Canada members have held, and continue to hold, leadership roles in specific standards projects (work items) and task groups in relation to ISO/TC229. Industry personnel involved in nanotextiles are invited to join Canada's Nano SCC Mirror Committee as volunteer members. Contact Brian Haydon, CSA Group. Adoption is the publication of a national standard based on a relevant international standard. Adoption can be identical or contain certain types of deviations to suit national conditions. The standard's deliverables from the international standards process (ISO and IEC standards), when published, can be reviewed nationally and adopted as National Standards of Canada for subsequent voluntary use or for reference in regulations in Canada. The process for this SCC-accredited activity for nanotechnology standards from ISO/TC229 or IEC/TC113 is facilitated by CSA Group. It includes public review, open to comments from any source, with development, review and ballot by a CSA technical committee. In general, a National Standard of Canada (NSC) is a consensus standard prepared by an accredited SDO and approved by the Standards Council of Canada. To date, adoption by Canada of one ISO/TC229 standard is near completion. This involves adoption of ISO/TR 12885:2008—Nanotechnologies—Health and safety practices in occupational settings relevant to nanotechnologies. Canada, through the Nano SCC Mirror Committee, provided ongoing input to the development of this international document. The CSA Group Nano-OHS Technical Committee, now adopting this standard for use in Canada, has added Canada-specific content for ease of use and to incorporate important guidance from Canadian research and best practices, including the precautionary principle. The adopted standard (CSA Z12885) has been renamed Nanotechnologies—Exposure control program for engineered nanomaterials in occupational settings (see Annex D for a brief summary). Another standard beginning CSA Group Nano-OHS Technical Committee review for adoption is ISO/TR 13121:2011—Nanotechnologies—Nanomaterial risk evaluation (see Annex D for a brief summary). Both of these standards support the Quebec Commission de l'éthique de la science et de la technologie recommendation "that the Quebec government, guided by the principle of precaution and from the perspective of sustainable development, be concerned with all phases of the life cycle of a product derived from nanotechnology or containing nanometric components, and that in this respect it should integrate the concept of 'life cycle' into all policies where such approach is appropriate, in order to avoid any damaging impact of technological innovation on health and the environment." The CSA Group standards development process, applicable to ISO or IEC adoptions, is illustrated in Figure 3. A representative from the textile industry currently sits as an associate member on the CSA Group Nano-OHS Technical Committee. The figure outlines a seven stage process by which the CSA Group facilitates the development of standards. The seven stages are as follows. Stage 0 is called "Project definition request". Stage 1 is called "Evaluation", which is composed of three sub-stages which are: Evaluation, Authorization, and Notice of Intent. Stage 2 is called "Drafting", which is composed of the sub-stages of: prepare work draft and project schedule. 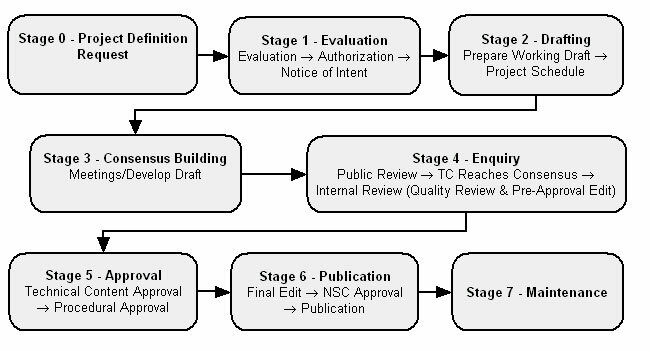 Stage 3 is called "Consensus Building" during which a draft version of a standard is developed. Stage 4 is called "Enquiry", for which the sub-stages are: public review, consensus by the technical committee, and internal review for quality control. Stage 5 is called "Approval", for which the sub-stages for stage 5 are technical content approval and procedural approval. Stage 6 is called "Publication", for which the sub-stages are: final edit, approval, and publication. Stage 7 is titled "Maintenance". Source: CSA Group standards development process. Promote good practice in the production, use and disposal of nanomaterials and nano-enabled products. At the technical committee level, ISO/TC229 is chaired and administered (secretariat) by the United Kingdom; IEC/TC113 is chaired by the United States and administered by Germany. For operating efficiency, the work of these technical committees is subdivided among working groups (WGs). With many other ISO or IEC technical committees, work is subdivided among more independent subcommittees. For nanotechnologies, the importance of communication among subgroups was recognized from the beginning. A subgroup structure of working groups, instead of subcommittees, was considered more appropriate to ensure that at international meetings all subgroups run concurrent meetings of the working groups, but join together in a plenary session at the beginning and end of ISO/TC229 meetings (currently held every six months). Each working group of ISO/TC229 and IEC/TC113 has a designated country that has volunteered to convene its activities. Within each working group, work items are initiated following the ISO/IEC standards development process towards end deliverables, such as technical reports, technical specifications or international standards, in accordance with a technical committee-directed business plan. Common language was a priority for effective communication among countries. Canada, as convenor of JWG1, Terminology and Nomenclature, was given a head start through a national document available from the United Kingdom in 2006 containing preliminary definitions for a range of nano-related terms. This seed document led to the development of science-based terminology. A hierarchical approach was followed with terms fitting into relationships with each other, the initial plan being a ten-part joint ISO/IEC vocabulary series of standards for nano-specific terms and definitions. A criterion included the need for uniqueness and specificity at the nanoscale to avoid unnecessary proliferation of "nano" as a prefix. For WG2, Measurement and Characterization, work first focused on measurement methods specific to carbon nanotubes, with project leads from the United States and Japan . This covered many of the unique measurement instruments used in nanotechnologies. Although specific to one family of nanomaterials, it was recognized that such measurement methods may serve as a model for subsequent development of measurement and characterization standards for other nanomaterials. Standards of interest to nanotextile innovators will be those that 1) measure, test and differentiate materials; and 2) create standard reference materials that are certified as possessing specified characteristics traceable to a fundamental system of physical units of measurement. For WG3, Health, Safety and Environment, work began with projects on health and safety practices in an occupational setting and attempts to characterize what parameters in nanomaterials are a priority for measurement for toxicological assessment. Other projects involving occupational health and safety and material safety data sheets (MSDS) and toxicological assessment followed. Standards from this group are recognized as a source of guidance in this subject area. Regulatory protocols for the health, safety and environmental aspects of nanotechnologies are also being developed internationally by the OECD and within individual countries and regions, including Canada, the United States and the European Union. Such activities are closely monitored by ISO/TC229 to reduce the risk of duplication and to encourage collaboration. As well, consumer interest representation on Canada's Nano SCC Mirror Committee has provided input to WG3 work items, along with Canadian participation from federal and provincial government, research and industry interests. WG4, Material Specification, was added in 2008 with the recognition that standards to assist in the trading of nanomaterials are crucial for commercialization. Some material specifications were begun, recognizing that as development progresses generic specifications may be possible. However, application-specific work may best progress in established product-specific ISO/IEC technical committees through collaboration with ISO/TC229; for example, ISO/TC38,Textiles. To achieve responsible and ethical commercialization of nanotextiles in the global marketplace, it is critically important to develop internationally accepted standards for describing and using nanotextile products. In addition to supporting commercialization, standards also support market development, provide a basis for procurement materials' specifications and repeatability, and provide a basis for appropriate regulation. Standards of interest to nanotextile innovators will be those that 1) describe and specify product materials; and 2) agree on specifications for commercial products where nano-specificity is required. For WG3, Performance Assessment, a more product-driven approach has been followed recognizing that strength in standards for nano-enabled electrical and electronic products comes from assurance that quality will not be compromised with added nano-related features, but is identified and controlled in production processes. Standards following the IEC/TC113 business plan are intended to address all stages in the life cycle of electrotechnical products enabled by nanotechnology. The focus of standardization activities is on products whose performance is inherently related to the use of nanomaterials and nanoprocesses. Examples of product sectors covered are nano-enabled batteries, photovoltaic cells, lighting devices and printed electronics. Currently, IEC/TC113 concentrates on nanomanufacturing processes and quality management. Nanotextile innovators applying electrical capabilities to textiles may be interested in the standards work of this technical committee. In 2012, seven years after TC229 was formed, ISO/TC229 and IEC/TC113 have completed 23 published standards (see Annex B), with an equal number of standards at various stages of completion (see Annex C). ISO/TC229 now has 34 participating country members and IEC/TC113 has 17 participating country members. With ten standards published in 2011 and six more anticipated in 2012, dissemination of this information is now a priority to ensure that potential users are aware of the availability of these standards. Communication among industry associations, such as the CTT Group, is important to get this information out to members who are applying nanotechnologies to materials, components and products. New work items for standards at the ISO or IEC, specific to product sector applications, are possible to meet industry needs through industry involvement. Contact Brian Haydon, CSA Group, brian.haydon@csagroup.org. ISO and IEC development processes include periodic maintenance of standards to ensure that these "living" documents keep pace with technology. Also, the ISO/IEC process has specific types of standards, which have an advantage in an emerging field such as nanotechnology. Progression through these documents can occur in successive editions. A standard may be designated first as informative, as a technical report (TR) (data obtained from a survey carried out among national bodies, data on work carried out in other international organizations or data on the "state of the art" in relation to standards of national bodies on a particular subject). Then a committee can move to more normative requirements on the same subject in subsequent editions, the second being a technical specification (TS) (subject matter is still under development as this new subject area evolves) and the third an international standard (IS) with primarily normative requirements. This process fits well with the evolving nature of nanotechnologies as it moves from research-dominant content, primarily guidance and best practices, to commercialization, when specific requirements may become more dominant. More mature subject areas may skip these steps, but for nanotechnologies, a technical report is often the starting point to allow frameworks to be established and best practices to become understood for a topic, followed by a technical specification and eventually an international standard in later editions. Standards will evolve and change with new technology. Monitoring revisions and new standards is an important exercise that most in the textile industry would be familiar with. For nanotechnologies, involvement with the Nano SCC Mirror Committee as an individual industry member, or as a representative industry member reporting back to an industry association, is a means that could be followed. Textile industry members can subscribe to information updates with applicable SDOs to monitor new developments specific to nanotextiles. New connections to CSA Group, the Nano SCC Mirror Committee and other applicable SDOs are recommended. Standards are living documents and will change as technology evolves. Being part of the standards development process of relevant committees can assist industry innovators in nanotextiles. In addition to developing standards, pertinent activities in Canada and other countries are often reported by standards committees. As well, information connections are frequently made by members involved with standards development committees. CSA Group is a not-for-profit membership-based association serving business, industry, government and consumers in Canada and the global marketplace. As a solutions-oriented organization, CSA Group works in Canada and around the world to develop standards that address real needs, such as enhancing public safety and health, advancing quality of life, helping to preserve the environment and facilitating trade. CSA Group develops standards that meet the needs of Canadians and are used from coast to coast. On the global front, CSA Group works hard to ensure our national interests are advanced and Canadian voices are heard. This work has been prominent in nanotechnologies to support Canadian stakeholder needs. CSA Group has led Canadian delegations to 15 meetings of ISO/TC229 since its inaugural meeting in London, England, in December 2005 and most recently in Johannesburg, South Africa, in November 2011. CSA Group participates prominently in such international groups and forums, which create standards aimed at enhancing trade and promoting safety and well-being. CSA Group also develops national standards, with some specific to Canadian usage, while others are adoptions of international ISO and IEC standards. CSA Group's policy is to harmonize its standards with international standards wherever possible, consistent with the needs of Canadian society and its customers, both Canadian and international. For textile innovators, a recommendation is to become involved in international standards work for nanotechnologies. Along with this, a complementary option to consider is to develop select national standards for textiles as a means to document best practices, guidance or requirements for use in Canada for subject matter not yet addressed internationally. Such national-based standards can often be developed, and put in place, over a shorter time frame than international-based standards. Published CSA Group national standards can then be used in Canada and be the basis of seed documents for international standards that could be proposed by Canada to the ISO or IEC in the future. For nanotechnologies, an “international standards first” strategy has been followed. This is unique in that for many traditional sectors country-specific standards have been developed first. This is frequently followed, often years later, by extensive work to harmonize them into international, multi-country-applicable standards. Understanding from the start that nanotechnologies research and trade are global, founding member countries of ISO/TC229 agreed to follow a globally focused path and develop international standards from the beginning. Barriers to global trade are to be minimized from the beginning in the interest of economic prosperity and social benefit from nanotechnologies. Regulatory aspects of nanotechnologies and means of implementation may vary among countries due to differing sovereign structures. However, cooperation by governments in regulatory aspects for nanotechnologies does occur under the OECD Working Party for Nanotechnolgy and the OECD Working Party for Manufactured Nanomaterials. Similarly, OECD and ISO/TC229 have a formal relationship to share information of interest at each organization’s respective meetings. As well, a U.S. and Canadian initiative to form a Regulatory Cooperation Council for regulatory cooperation in select areas, including nanotechnologies, is being planned. The availability of international standards from ISO/TC229 and IEC/TC113 makes referencing such standards a viable option for U.S. and Canadian regulators to consider. Cooperation in standards development between the United States and Canada is supportive of each country’s direction for nanotechnologies. Canada's delegations to international ISO/TC229 meetings work closely with U.S. delegates from their ANSI-accredited Technical Advisory Group for ISO/TC229, the equivalent to Canada's SCC mirror committee for ISO/TC229, particularly when a North American position is needed at international meetings. If issues related to nanotextiles arise, U.S. counterparts to Canada's Nano SCC Mirror Committee members are readily accessible for collaboration. There is little evidence of standards under development in the United States specifically for nanotextiles. Nanotextile research is extensive within European countries. Testing laboratories for the textile industry include, for example, the Hohenstein Institute, a recognized test centre under DIN EN ISO/IEC 17025, General requirements for the competence of testing and calibration laboratories. Standards applied include OEKO-TEX® Standards. These standards are recognized and applied in the textile industry. Applicability to nano-enabled textile products would need to be explored. Preliminary information indicates that Germany has been encouraged by WG4, Material Specification, of ISO/TC229 to prepare a presentation for the next meeting of ISO/TC229 in June 2012 on superhydrophobic textiles for a proposed new material specification standard. If this progresses to a new work item proposal (NWIP) from ISO/TC229, Canadian textile industry members who have joined the Nano SCC Mirror Committee would have an opportunity to participate as Canadian experts in this future work. Requirements for rates of performance after laundering, etc. For Canada's nanotextile innovators and importers, being aware of other countries moving forward with nanotextile standards is important. Such national standards may form the basis for submissions to international SDOs as new work items for future international standards. Use terminology from published ISO/IEC nanotechnologies vocabulary standards in business communications to apply and promote common language and understanding. Review and determine applicability of measurement methods from published ISO/IEC nanotechnologies measurement standards. These can serve as models for effective and repeatable measurement to specify nanomaterials and control processes. Form a nanotextiles standards committee under CSA Group or the CTT Group to share information on international nanotechnologies standards relevant to the textile industry. This could also serve as a forum to designate Canadian experts to participate and be involved in standards work specific to nanotextiles. Members would also have the opportunity to lead new work items in standards for nanotextiles where the member has the expertise and support to do so. Textile innovators should consider developing select national standards as a means to document best practices, guidance and requirements for use in Canada for subject matter not yet addressed internationally. National-based standards can often be developed, and put in place, over a shorter time frame than international-based standards. Published national standards could then be used in Canada and be the basis of seed documents for international standards that could be proposed by Canada to the ISO or IEC in the future. Canadian textile industry members of ISO/TC38, Textiles, and other textile-related ISO technical committees, should consider establishing a relationship with ISO/TC229, Nanotechnologies. This will assist with collaboration and awareness of international nanotechnologies standards work that could benefit the textile industry, including Canada. Individual textile industry membership or textile association representative membership on Canada's Nano SCC Mirror Committee is recommended to stay abreast of developments in standards that could benefit nanotextile innovators. This also serves as a means for the textile industry to be heard as standards for nanotechnologies are developed. Participate in textile industry association forums related to nanotextiles and nanotechnologies to learn more about and become involved in standards to assist with commercialization of nanotechnologies. The figure is comprised of a large flow chart that fills an 8 by 11 inch page. It flows from the top of the page down to the bottom. The stages, or levels, of the flow chart are first the inputs to the textile industry, secondly the textile industry itself, followed third by the factories (e.g. products) and services offered by the markets these textiles are incorporated into, and then finally the stage of marketing and sales. In order to describe these stages of the flow chart in more detail, we return to the top of the flow chart to describe the introductory stage or level called inputs. Examples of inputs are polymers, filaments, natural fibres, chemical fibres, and dyes and resins. The next stage, titled textile industry, is composed of the activities of fibre spinning, throwing, texturing, and twisting, fibre, weaving, knitting, braiding and tufting, nonwovens and felts, finishing, ennobling, coating, laminating and converting. Services at this stage include research and development, training, design, engineering, advertising, and information technology. At the end of these textile industry activities and products just listed, the textiles can be considered as flexible materials in spools and/or rolls. The next stage is called factories (e.g. products) and services. These products and services can be considered the markets these textiles are used in. These markets are listed as: clothing and accessories, furniture and household items, industrial uses such as filtering, transportation, material, medical, packaging, protection, reinforcement, sporting goods, leisure and sportswear, and finally the industries of agriculture, construction, civil engineering, and environment. The final steps of the value chain involve getting the products to customers, also known as the marketing and sales stage. This stage is comprised of wholesaling, retailing, and consuming. *In progress as of March 2012. This ISO/TR adoption provides guidance to address health and safety related to nanotechnologies in the workplace. ISO/TR 12885:2008 presents a comprehensive and in-depth review of nanomaterial health and safety risks in the workplace.This technical report is a repository of health and safety practices for parties managing occupational interaction with nanomaterials. It is an essential resource. The standard describes in basic detail the major categories of nanomaterials by their properties and production. Highlighted materials include carbon containing nanomaterials, oxides, metals, quantum dots, organic polymeric nanomaterials and bio-inspired nanomaterials. The hazard characterization section of the standard outlines types of health and physical risks and how nanomaterials may relate to them. It delves further into health effects using animal and cell studies for each of the aforementioned materials. Exposure to nanomaterials is covered extensively, with reference to both scientific and practical methods of assessing exposure. This standard suggests several components of a complete risk assessment portfolio that may be used to identify best practices in the workplace. Action based upon results of the risk assessment may be taken through control methodologies explained in the standard. New technological developments are often a balance between risk and reward. Whether referring to the impact on human health, the environment or unsustainable resources, technology must balance both positive and negative traits. ISO/TR 13121:2011 presents a comprehensive review of best practices towards evaluating the safe and ethical introduction of nanomaterials. ISO/TR 13121:2011 is an invaluable resource for any party interested in developing or using nanomaterials. This standard is applicable regardless of operational scale and presents an adaptable framework towards risk analysis of nanomaterials. The standard includes guidance for nanomaterial life cycle evaluation. The standard also presents profiling methodologies for physical and chemical properties, and hazards associated with exposure to nanomaterials. Using these profiles, a risk evaluation is described. Risks may then be managed and reviewed using methods recommended in the standard. Annexes in the standard include resources (listed above) for nanomaterial risk evaluation. In a new field such as nanotechnologies, clear communication is a major determinant of success. ISO/TS 12805:2011 presents a thorough system of specifications and measurements to improve the communication of nano-object design. This standard outlines quality control specific to nanotechnologies. It directs congruent expectations for nano-objects as they progress downstream in supply chains. Testing methodologies are categorized by the nanoscale dimensionality and form of the nano-objects. Additional metrics are supplied for applications or properties that require more specificity. ISO/TS 12805:2011 describes the impact of impurities and contaminants on quality as well as means for identifying other properties specific to a unique nano-object process. Annexes provide a decision tree for the standard and descriptions of each test referenced. This set of measurement methods is non-exhaustive and subject to expansion with further development of the nanotechnologies field. Standards Council of Canada, Canadian Standards Development: System Requirements. CAN-P-1:2011. Group CTT, Inventaire des standards, certifications, réglementations, législations et processus d’achats publics. Final report, 2010. BSI Group, How We Produce British Standards. 2012. Retrieved on March 30, 2012, from http://www.bsigroup.com/en/Standards-and-Publications/About-BSI-British-Standards/How-we-produce-British-Standards/. Haydon, B., Nanotechnologies: Industry Trends and Priorities in Canada for Standards Development. CSA Group, 18—20, 2009.
International Organization for Standardization, Nanotechnologies—Vocabulary—Part 1: Core Terms.ISO/TS 80004-1:2010.
International Organization for Standardization, Nanotechnologies—Terminology and Definitions for Nano-objects—Nanoparticle, Nanofibre and Nanoplate. ISO/TS 27687:2008.
International Electrotechnical Commission, Nanotechnologies—Vocabulary—Part 9: Electrotechnical Products and Systems. PWI 80004-9 Ed. 1.0, preliminary draft. International Organization for Standardization, Nanotechnologies and Sustainability—Guidance and Questions on Sustainable Development. ISO/TC229/TG3 N39 (2011), Prepared for ISO/TC229 Nanotechnology and Sustainability TG3 Meetings in Johannesburg, South Africa. International Organization for Standardization. ISO/TC38 Business Plan. 2012. Retrieved on March 30, 2012, from http://isotc.iso.org/livelink/livelink/fetch/2000/2122/687806/ISO_TC_038__Textiles_.pdf?nodeid=803713&vernum=-2. Standards Council of Canada, Orientation Module to SCC Canadian Procedural Document (CAN-P) 7. 2011. Retrieved March 30, 2012, from http://www.scc.ca/en/get_involved/orientation-modules/can-p-7#panel-00-00 (accessed on March 2012). Sarma, H., Industry Participation in Nanotech Standards—Strengthening Ties. Presented at IEC/TC113/AG4—Chair Advisory Group, Seattle, WA, 2010. Technology Roadmap Steering Committee, eds., Technology Roadmap for the Canadian Textile Industry. CTT Group, 2011. Parsons, D., Bowler, P., Myles, V. and Jones, S., Silver Antimicrobial Dressings in Wound Management: A Comparison of Antibacterial, Physical, and Chemical Characteristics. Wounds, 17(8): 222—232, 2005. Stover, D., Potent New "Nanofabrics" Repel Germs. CNN Tech ., October 3, 2007. Retrieved March 30, 2012, from http://articles.cnn.com/2007-10-03/tech/nanotextiles_1_nanoparticles-clothing-dress?_s=PM:TECH. Ki, H.Y., Kim, J.H., Kwon, S.C. and Jeong, S.H., A Study on Multifunctional Wool Textiles Treated with Nano-sized Silver. Journal of Materials Science, 42: 8020—8024, 2007. Beringer, J., Nanotechnology in Textile Finishing: State of the Art and Future Prospects . Presented at the Materials Research Society Fall Meeting, Boston, MA, 2005. Zhou, J., Loftus, A.L., Mulley, G. and Jenkins, A.T.A., A Thin Film Detection/Response System for Pathogenic Bacteria. Journal of the American Chemical Society, 132(18): 6566—6570, 2010. Höfer, D. and Swerev, M., The Future of Medical Textiles: High-tech for the Well-being of the Patient. Journal of Textile and Apparel, Technology and Management, 3(2): 1—3, 2003. Mattana, G., Cosseddu, P., Fraboni, B., Malliaras, G.G., Hinestroza, J.P. and Bonfiglio, A., Organic Electronics on Natural Cotton Fibres. Organic Electronics, 12: 2033—2039, 2011. Orecchini, G., Zhang, R., Staiculescu, D., Tentzeris, M.M., Roselli, L. and Wong, C.P., Inkjet Printed Organic Transistors for Sustainable Electronics. Proceedings of the 2010 Electronic Components and Technology Conference, Las Vegas, NV, 2010. Berger, M., Novel Use of Polymer Nanofibers as Filters for Chemical Warfare Defense. Nanowerk, 2006. Retrieved March 30, 2012, from http://www.nanowerk.com/spotlight/spotid=555.php. Schoen, D.T., Schoen, A.P., Hu, L., Kim, H.S., Heilshorn, S.C. and Cui, Y., High Speed Water Sterilization Using One-Dimensional Nanostructures. Nano Letters, 10: 3628—3632, 2011. Schäfer, K., Thomas, H., Dalton, P.D. and Möller, M., Nanofibres for Filter Materials in Multifunctional Barriers for Flexible Materials . In Duquesne, S., Magniez, S. and Camino, G., eds., Multifunctional Barriers for Flexible Structure , 97(7):125—138. Heidelberg: Springer-Verlag, 2007. Kumar, S., Gupta, K. and Chien, A.T., Functional Polymer-polymer/Carbon Nanotube Bicomponent Fibers . NationalTextileCenter Annual Report, NTC Project:M10-GT02, 2010 . Jain, R. Carbon Nanotube Reinforced Polyacrylonitrile and Polt (etherketone) Fibers . Georgia Institute of Technology, Doctoral dissertation, 2009. Retrieved on March 30, 2012, from http://hdl.handle.net/1853/28257. Stevens, K., Brown, P., Ballato, J., Gipson, K. and Boyon, J., Light Emitting Nanocomposite Fibres (LENFs). NationalTextileCenter Annual Report, NTC Project: M10-CL05 , 2010 . Daoud, W.A. and Xin, J.H., Nucleation and Growth of Anatase Crystallites on Cotton Fabrics at Low Temperatures. Journal of the American Ceramic Society, 87(5): 953—955, 2004. Cardamone, J.M. and Martin, J.J., Keratin Coatings for Wool: Shrinkproofing and Nanoparticle Delivery. Macromolecular Symposia, 272: 161—166, 2008. Zimmermann, J., Reifler, F.A., Fortunato, G., Gerhardt, L.C. and Seeger, S., A Simple, One-step Approach to Durable and Robust Superhydrophobic Textiles. Advanced Functional Materials, 18: 3662—3669, 2008. Xue, C.H., Jia, S.T., Zhang, J. and Ma, J.Z., Large-area Fabrication of Superhydrophobic Surfaces for Practical Applications: An Overview. Science and Technology of Advanced Materials, 033002, 2010. Wong, Y.W.H., Yuen, C.W.M., Leung, M.Y.S., Ku, S.K.A. and Lam, H.L.I., Selected Applications of Nanotechnology in Textiles. AUTEX Research Journal, 6(1): 1—8, 2006. Zhang, F. and Yang, J., Application of Nano-ZnO on Antistatic Finishing to the Polyester Fabric. Modern Applied Science, 3(1): 89—94, 2009. Werner, M. and Brand, L. Focus Report 2010: Aerogels. European Commission: Observatory NANO, 2010. Aspen Aerogels, Inc. Spaceloft Insulation Data Sheet. 2011. Retrieved March 21, 2012, from http://www.aerogel.com/products/pdf/Spaceloft_DS.pdf . Sojka, M.F., Cummins, P.G., Declercq, L., Fthenakis, C.G., Ionita-Manzatu, M.C., Lee, W.A. and Giacomoni, P.U., UV Protection Afforded by Gel-trapped TiO2 Particles. Photochemical & Photobiological Sciences, 10(7): 1146—1151, 2011. Yang, H., Zhu, S. and Pan, N., Studying the Mechanisms of Titanium Dioxide as Ultraviolet-blocking Additive for Films and Fabrics by an Improved Scheme. Journal of Applied Polymer Science, 92: 3201—3210, 2004.
International Organization for Standardization / International Electrotechnical Commission, ISO/IEC Directives, Part 1—Procedures for the Technical Work.21, 2009. CSA Group, CSA Group Standards Development Process. Government of Canada, NanoPortal—Nanotech and Society. Retrieved on March 30, 2012, from http://nanoportal.gc.ca/default.asp?lang=En&n=9156F3D3-0. This document was prepared for Industry Canada by the Canadian Standards Association. Opinions and statements in the publication attributed to named authors do not necessarily reflect the policy of Industry Canada or the Government of Canada. Aussi offert en français sous le titre Les nanomatériaux et leur utilisation dans les textiles—Normes—Normalisation interne pour les fabricants et les importateurs canadiens et développements internationaux en matière de normalisation.